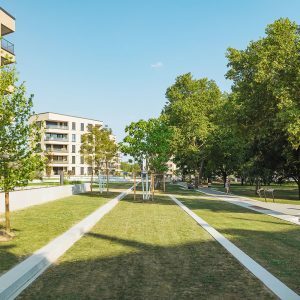 Creation of high-quality open space is our responsibility as well as challenge, which we face every day since the foundation of GREENBOX in 2002. 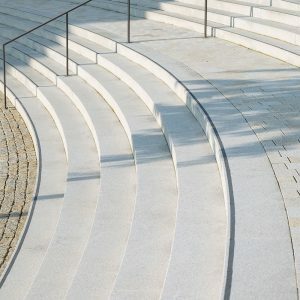 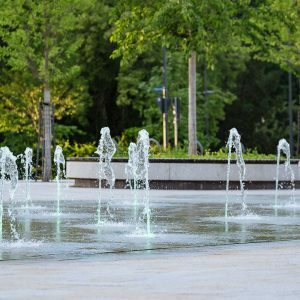 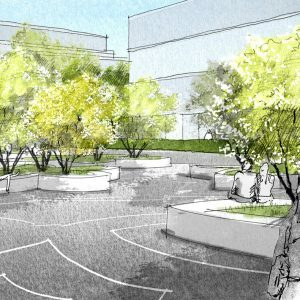 Our area of specialization is designing and execution of plazas, promenades, parks and other urban open spaces. 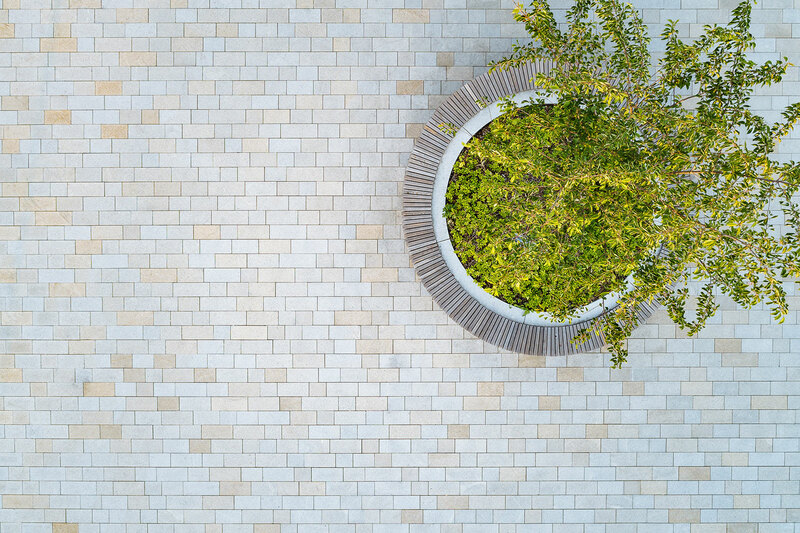 We aspire to create sustainable spaces, as our concepts take into account the needs of users and environment. 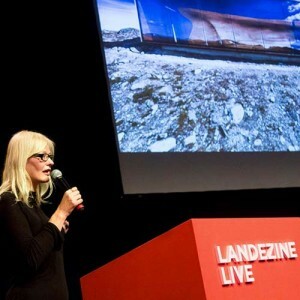 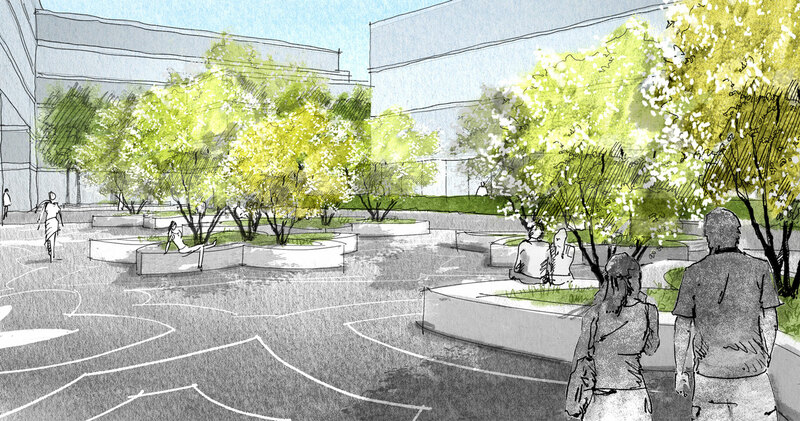 During the process, a great emphasis is put on holistic approach to architecture and landscape design. 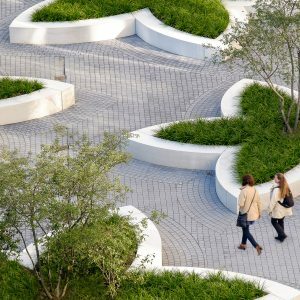 Site specific and tailor-made design solutions lead us to creation of unique space identity. 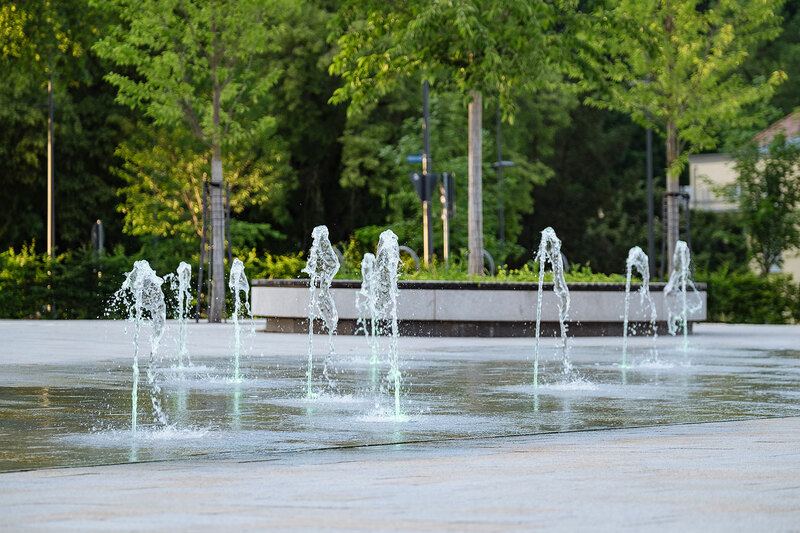 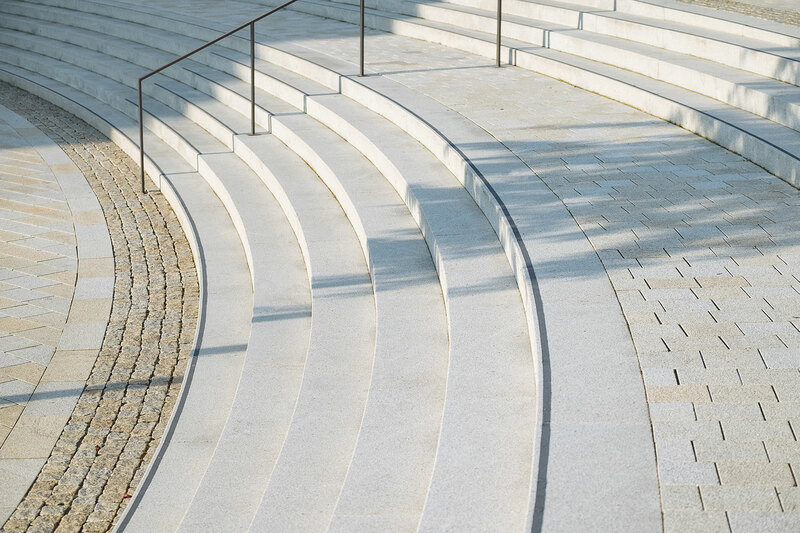 Our experienced team develops strategies for public spaces, cultural and educational institutions, swimming pools, sports and leisure facilities, medium to large corporate companies at home and abroad. 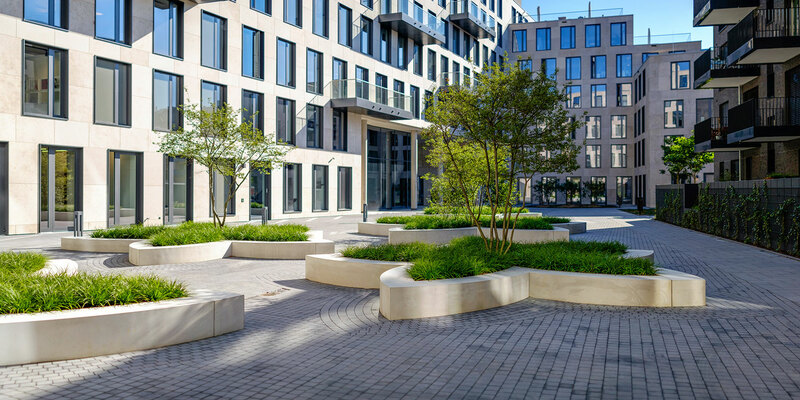 Professionalism, diligence and the personal contact to developers, architects and planners ensure high quality in our projects. 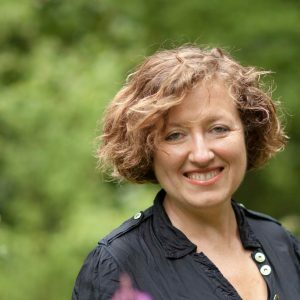 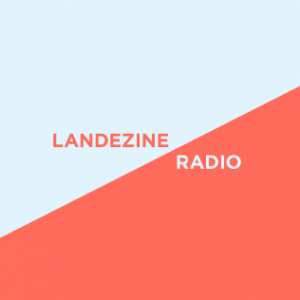 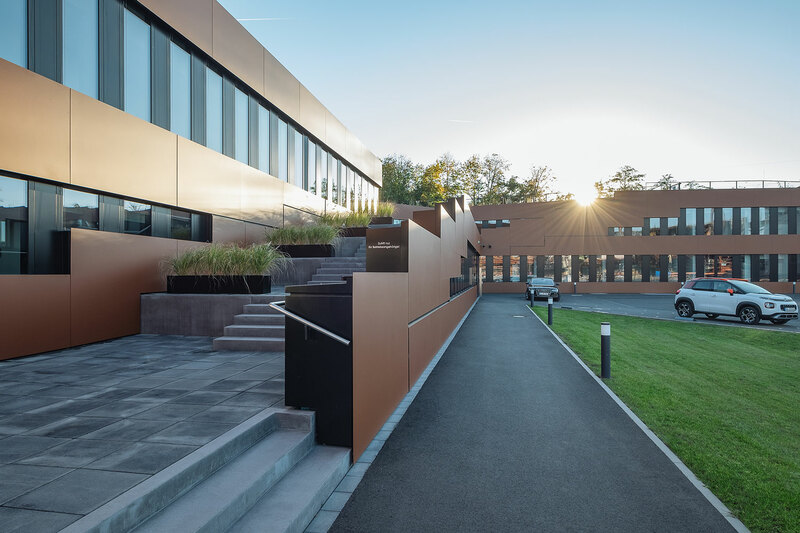 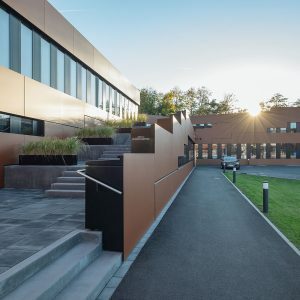 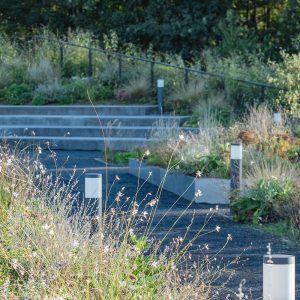 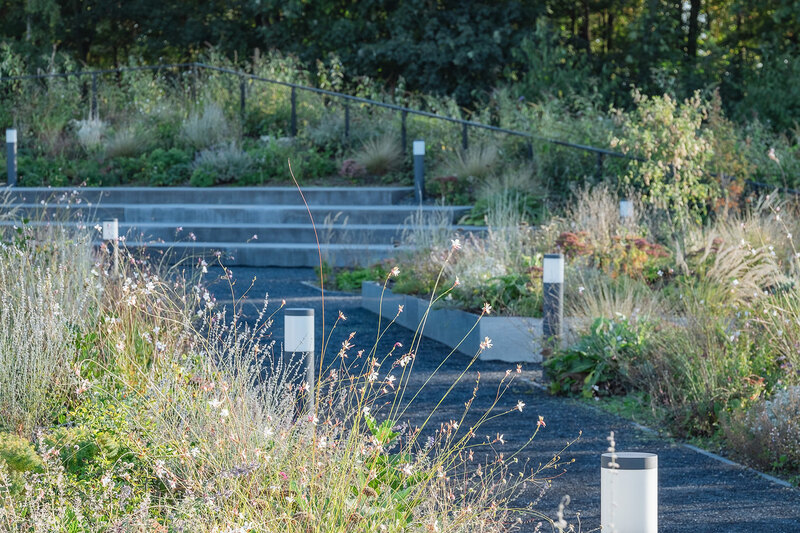 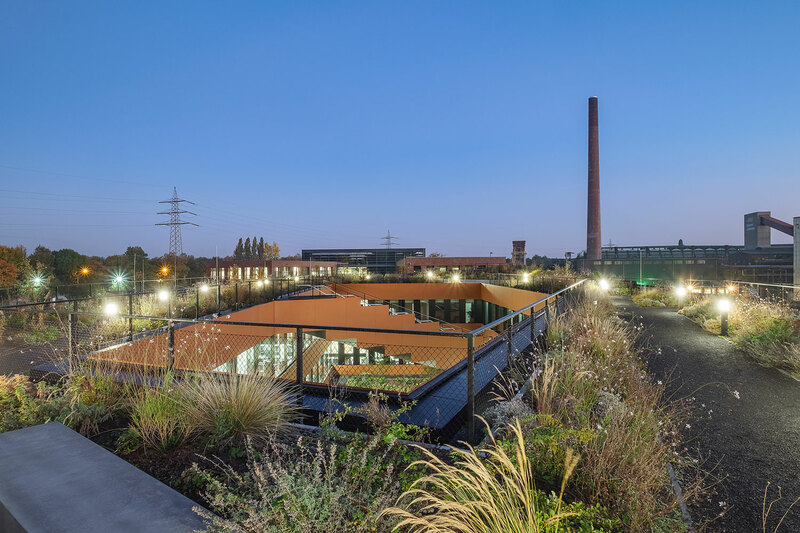 Under the leadership of Hubertus Schäfer and Markus Pieper currently 25 landscape architects, architects, site managers and draughtsmen work at offices in Cologne, Stuttgart and Düsseldorf. 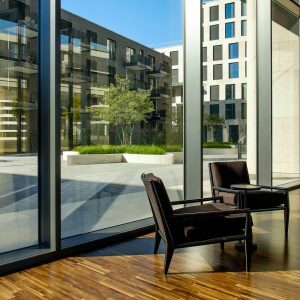 Our design ideas and projects have been acclaimed several times and have received numerous awards at national and international competitions. 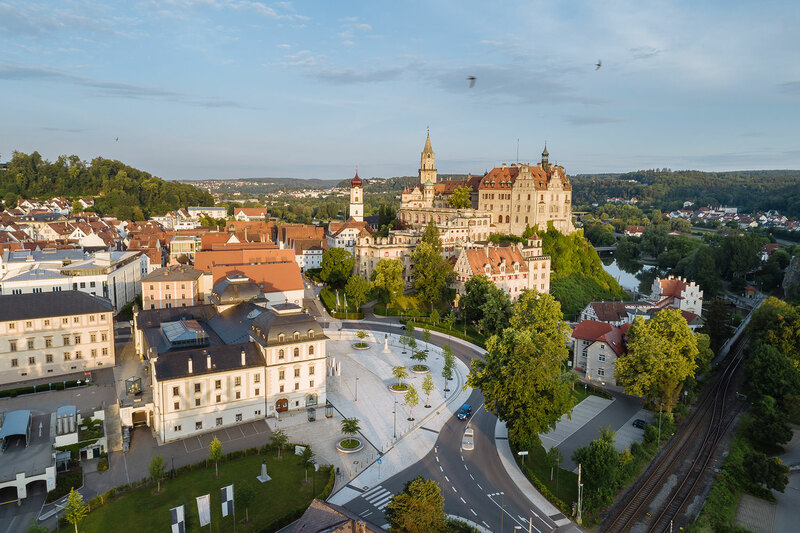 The city of Sigmaringen is located in a picturesque setting of Upper Danube valley. 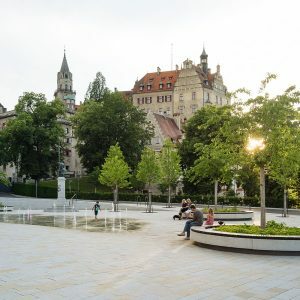 However, Karlsplatz, the northeastern entrance to the old town, is heavily affected by vehicular traffic. 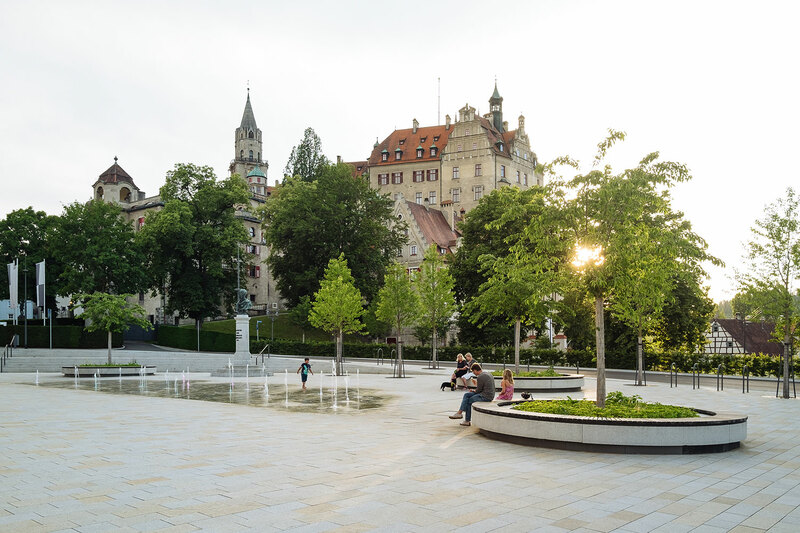 Situated between the former royal stables and the castle, it fails to become a final link to other city squares. 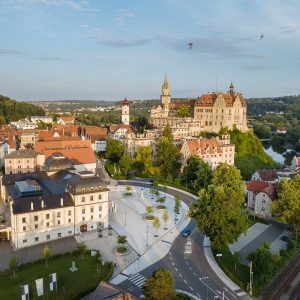 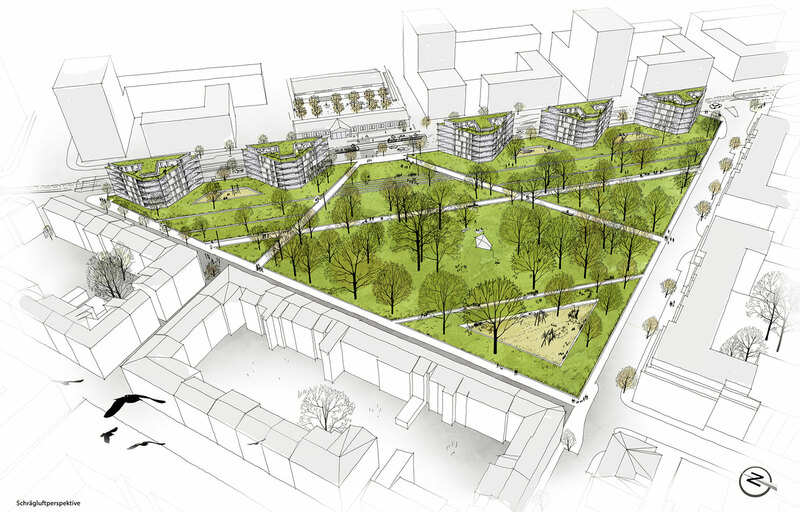 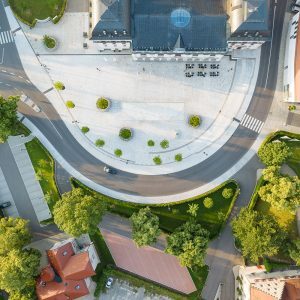 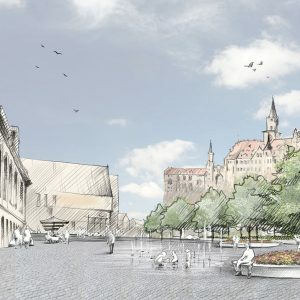 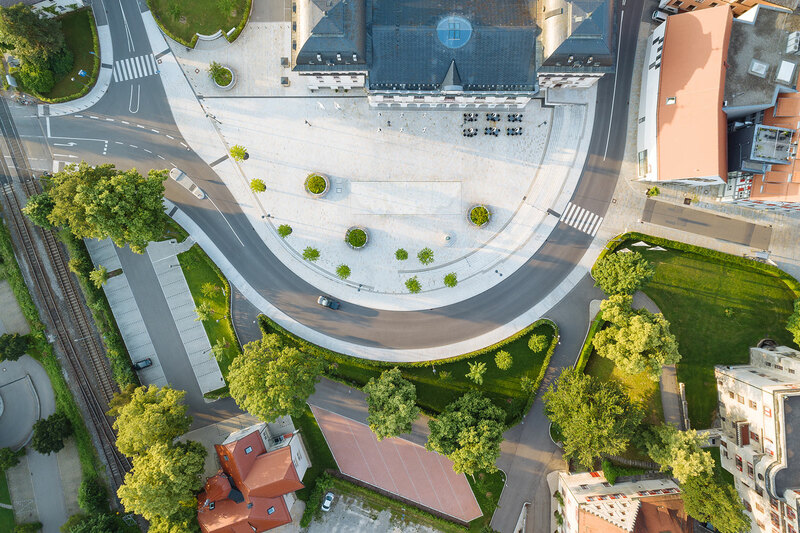 The new design, envisages Karlplatz as the middle ground connecting the heritage castle, Prinzen garden and the Danube meadows. 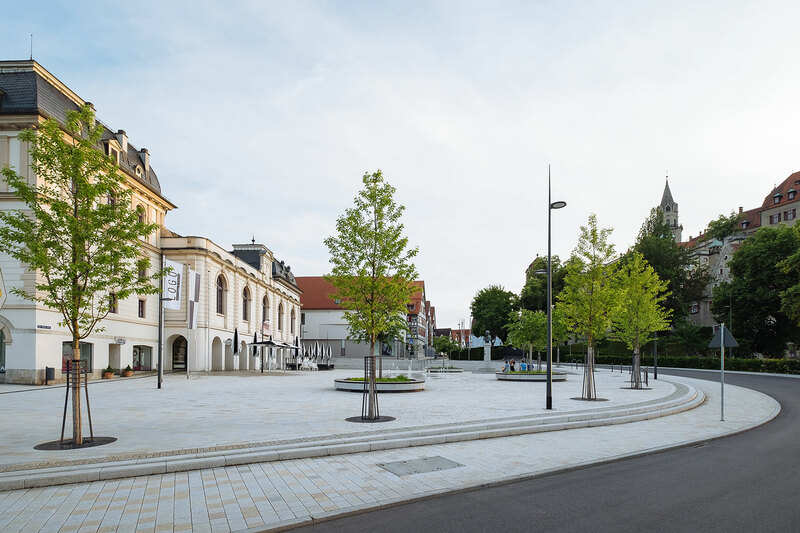 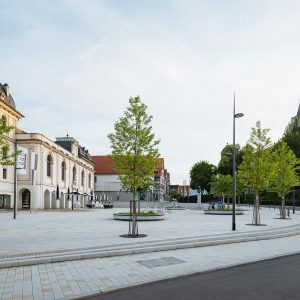 Relocation of Fürst-Wilhelm-Street in front of the historic stable enables creation of a spacious and high quality square. 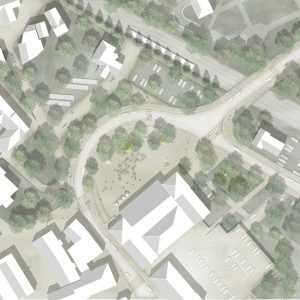 Proposed pedestrian connections ensure a strong connection to the old town in the west. 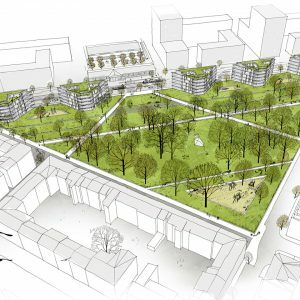 Historic value of the green area in front of stable has been reinterpreted and it’s relation to the adjacent parks has been retained. 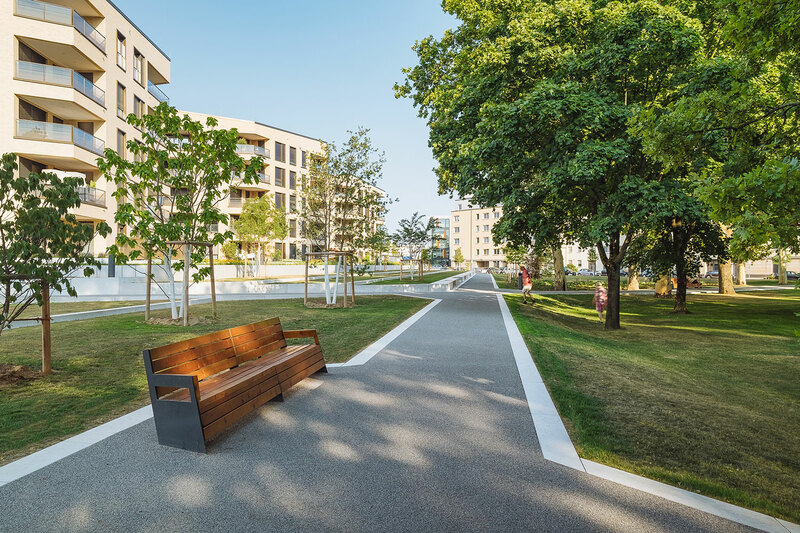 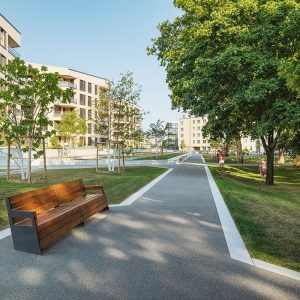 Row of cherry trees along the new street creates a permeable edge and maintains green connection to surrounding open spaces. 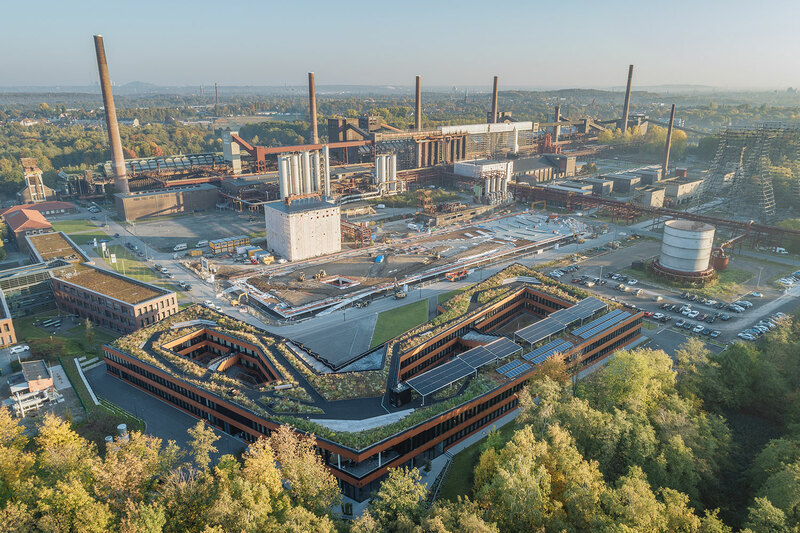 The new administrative building of RAG Foundation and RAG AG is located in Zollverein Essen, a renowned UNESCO World Heritage site. 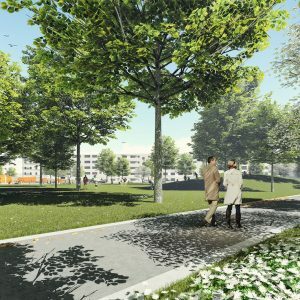 Being situated on the west side of iconic colliery tower and former coking plant, it demarcates the precinct corner at the transition to the adjoining Forest. 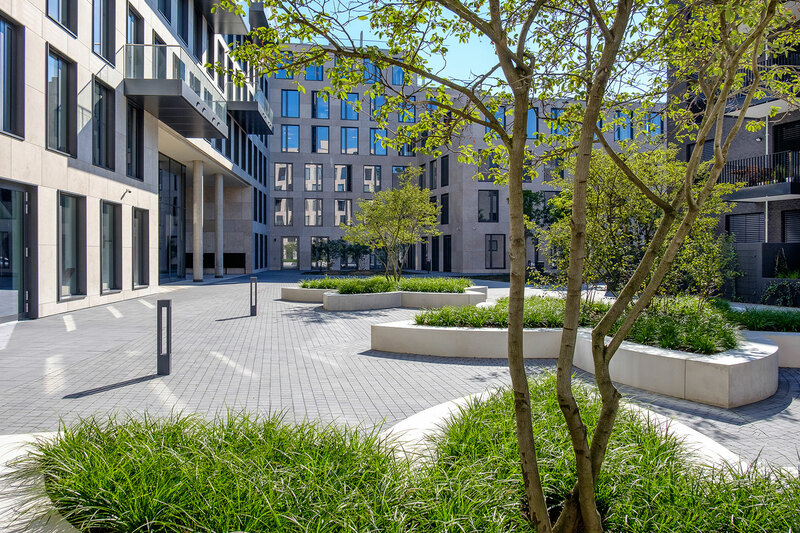 A sustainable design approach distinguishes the new administrative building. 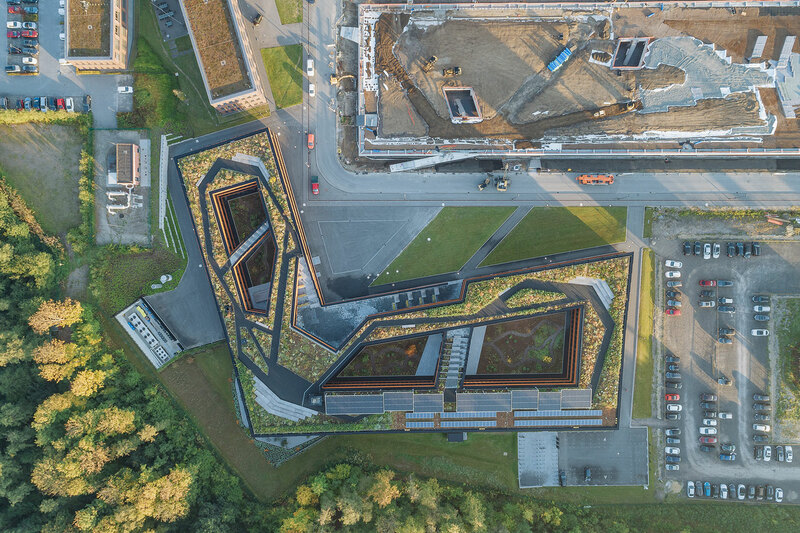 This L-shaped two story structure is characterized by accessible green roof. 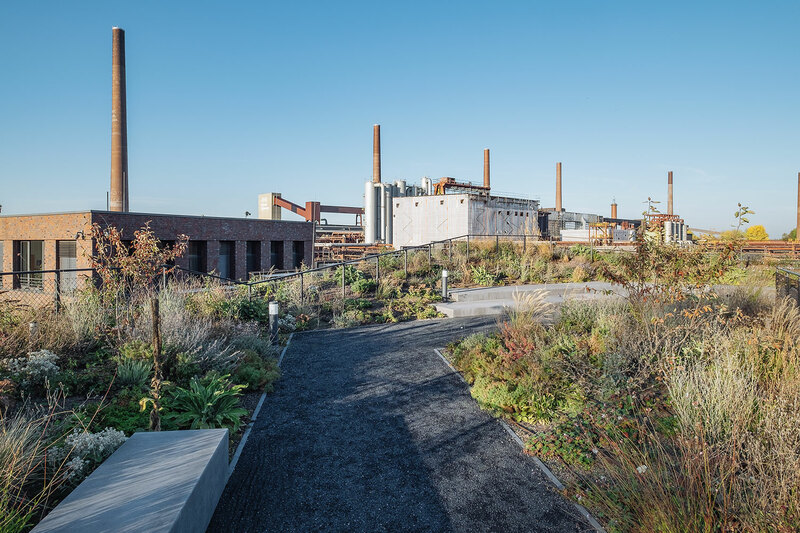 The proposed Corten steel facade draws inspiration from rusted metal pipes of the coal plant and does not limit itself to the prevalent brick facades of Zollverein. 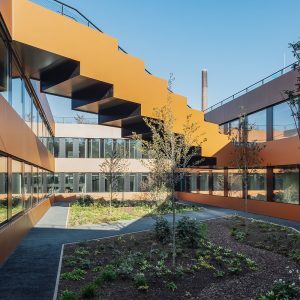 The construction material of this new building needs special mention, as it can be recycled in case of demolition. 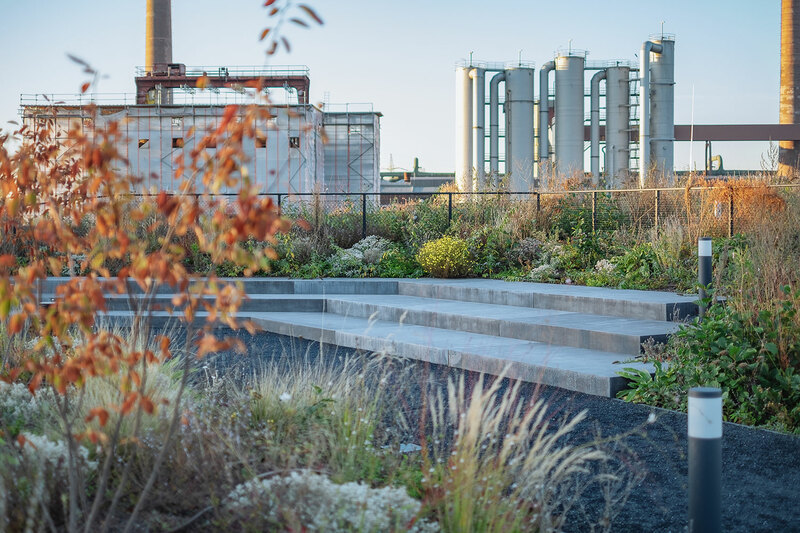 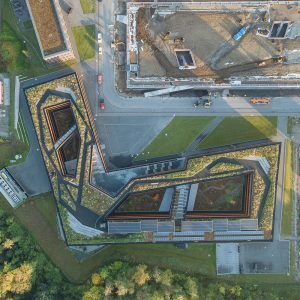 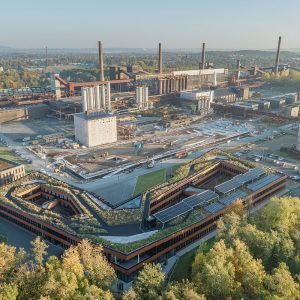 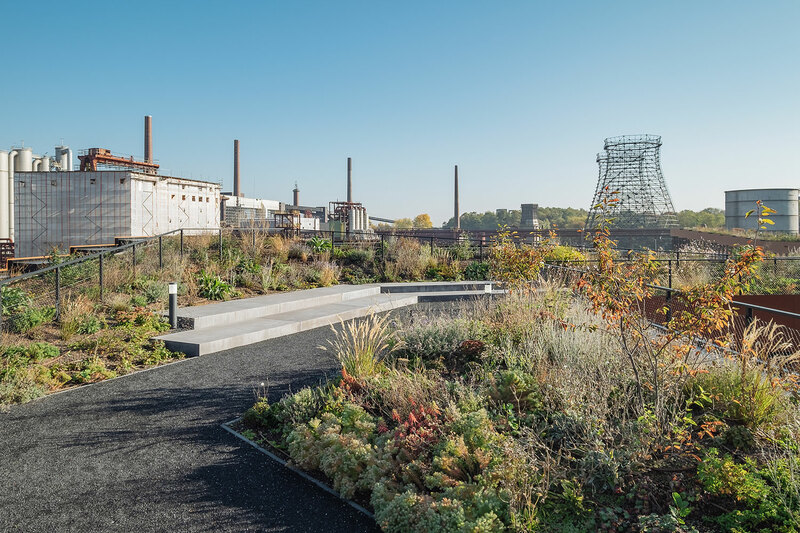 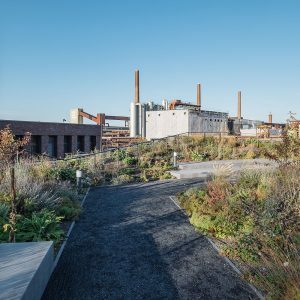 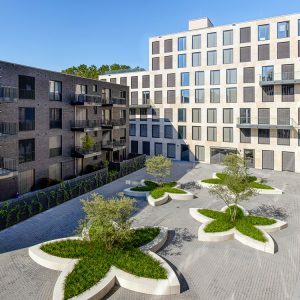 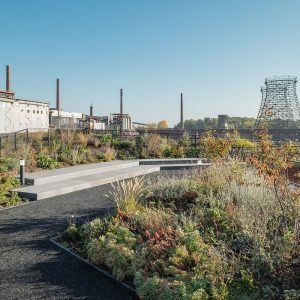 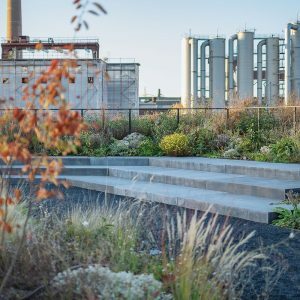 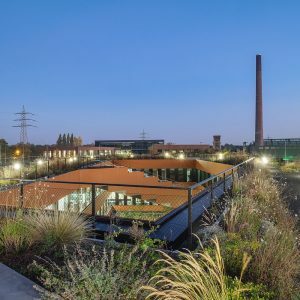 Therefore, not only reuse of Zollverein precinct symbolizes the notion of, cradle to cradle’, but also selection of building material follows the same sustainability principle. 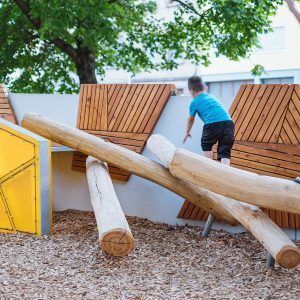 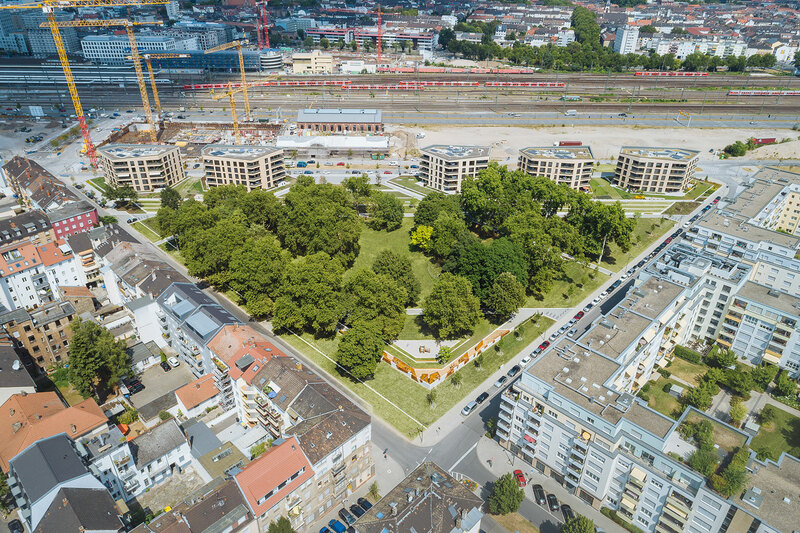 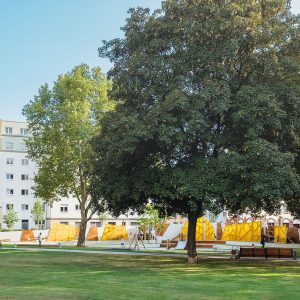 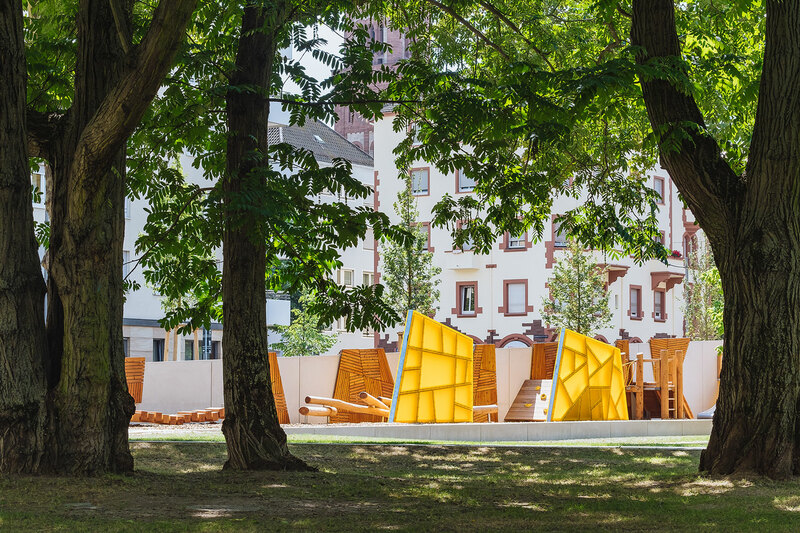 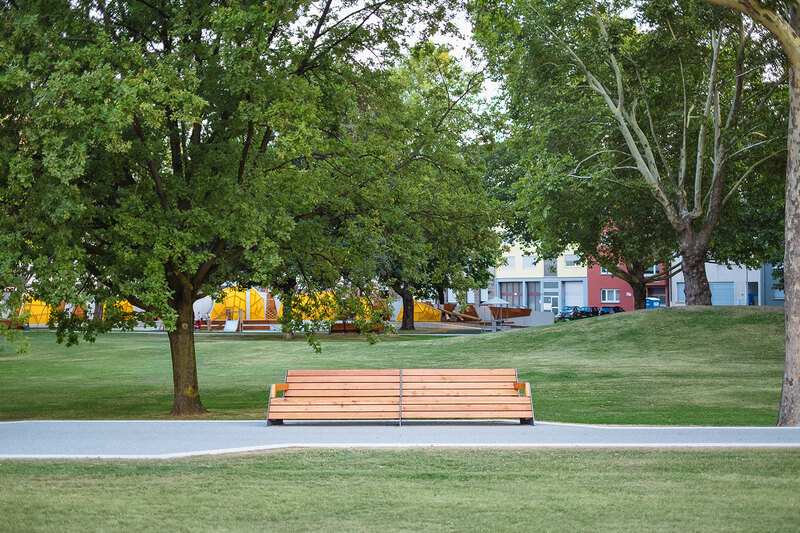 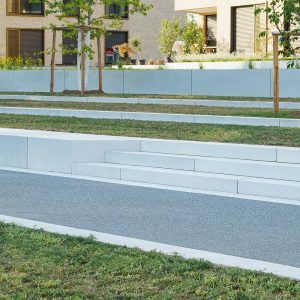 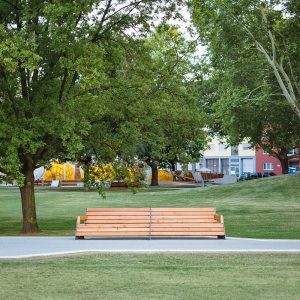 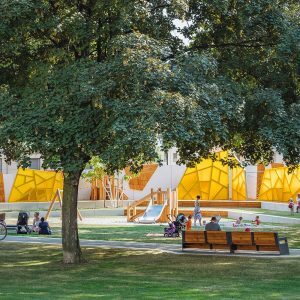 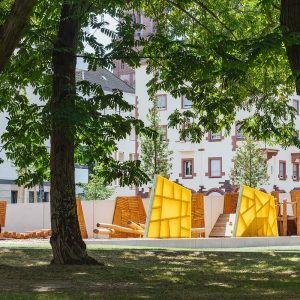 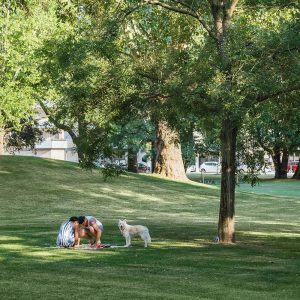 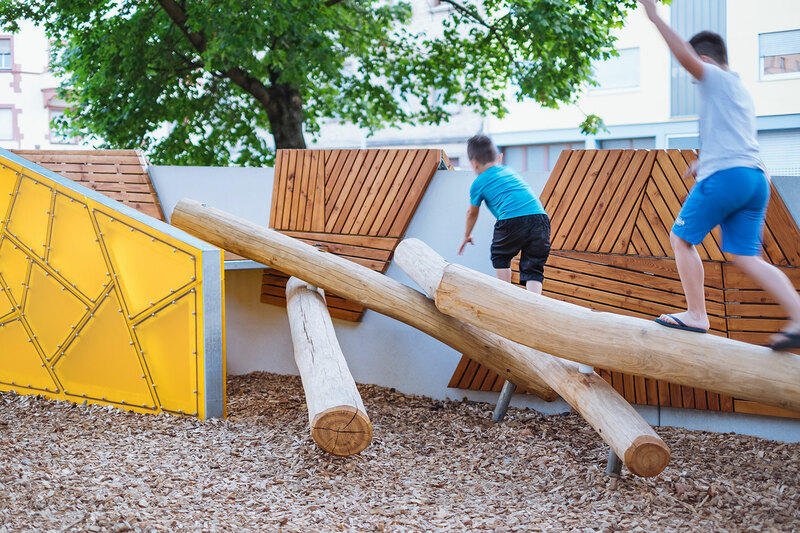 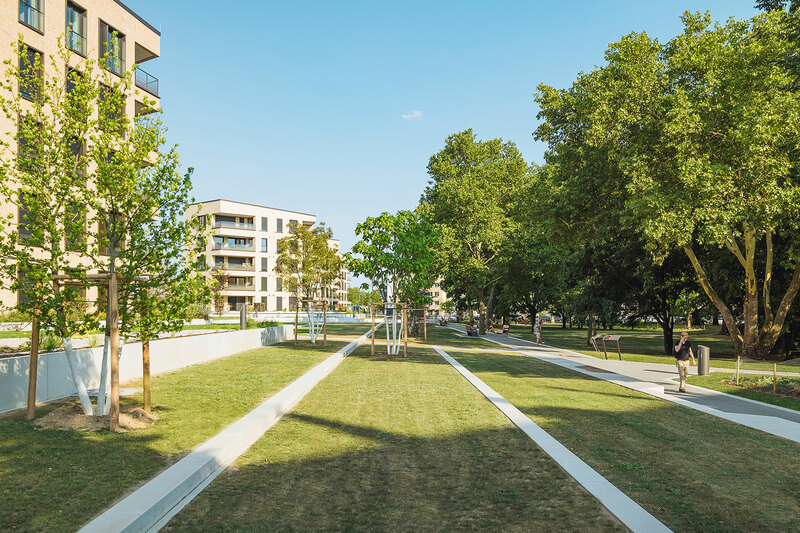 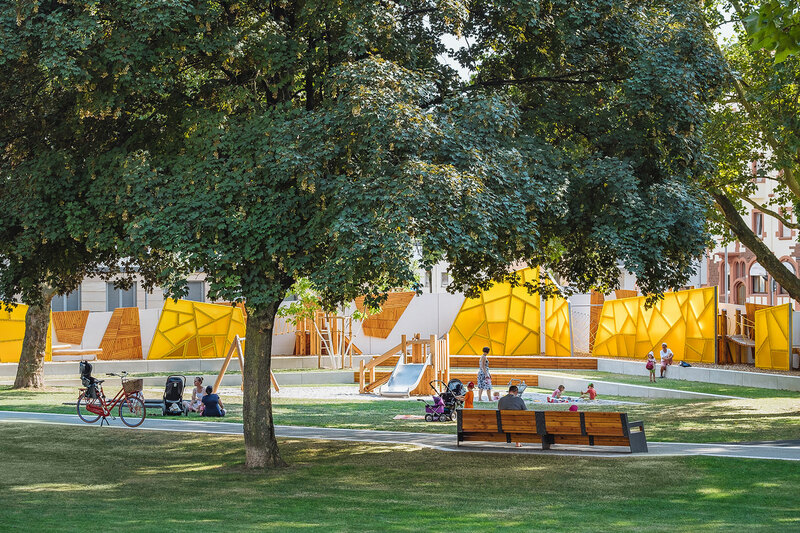 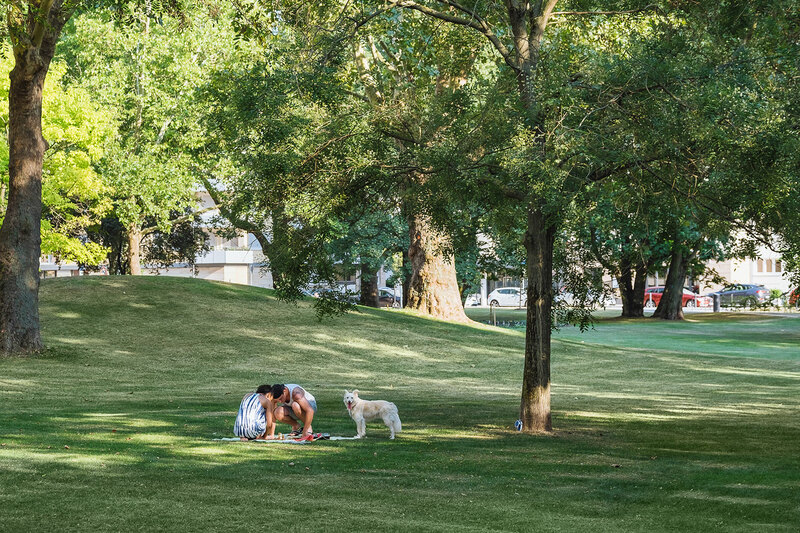 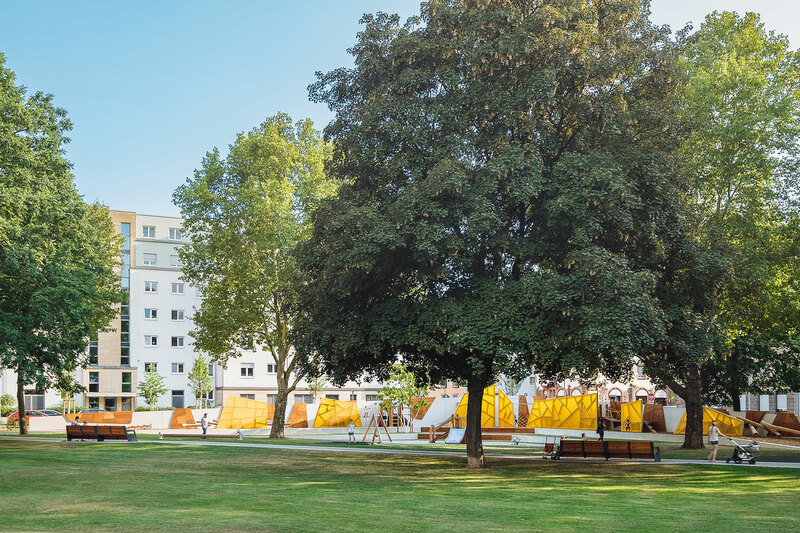 Characterised by large trees and lawn, the triangular park at Hans-Glückstein-Plaza is intended to serve the surrounding urban areas for leisure, play and recreation. 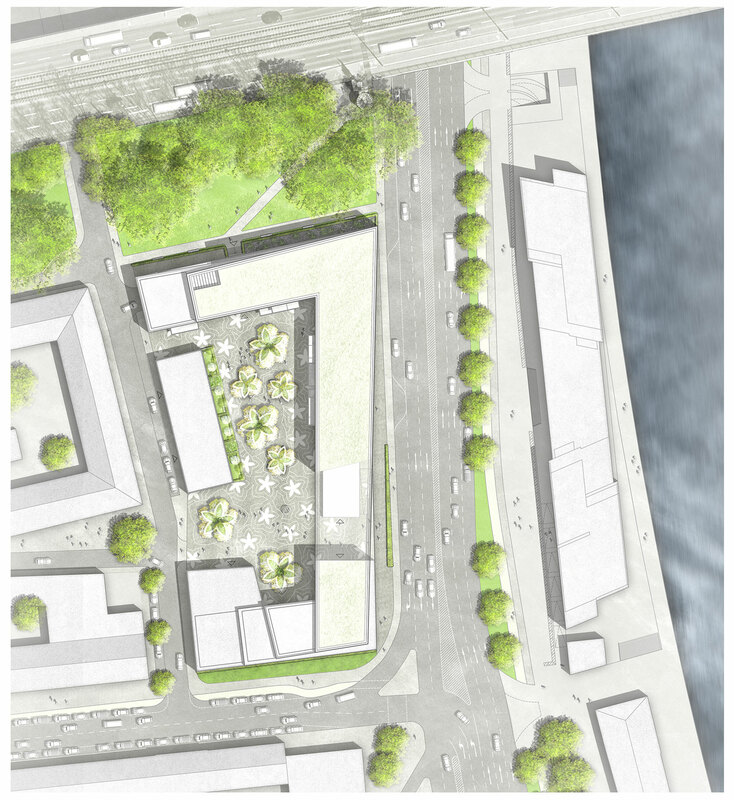 The task is to define the urban edge in the transition to the Glückstein quarter and to intertwine it at the same time. 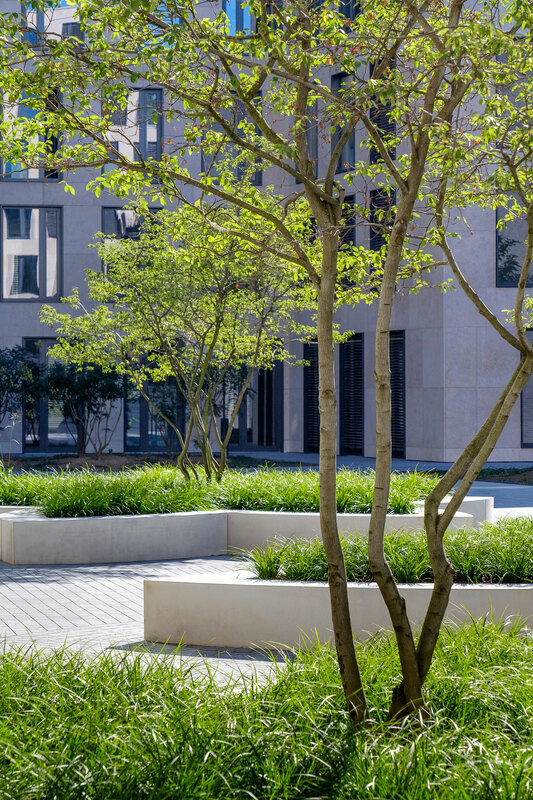 To extend the urban character to the south of Glückstein alley, a new residential area in form of villas, has been developed. 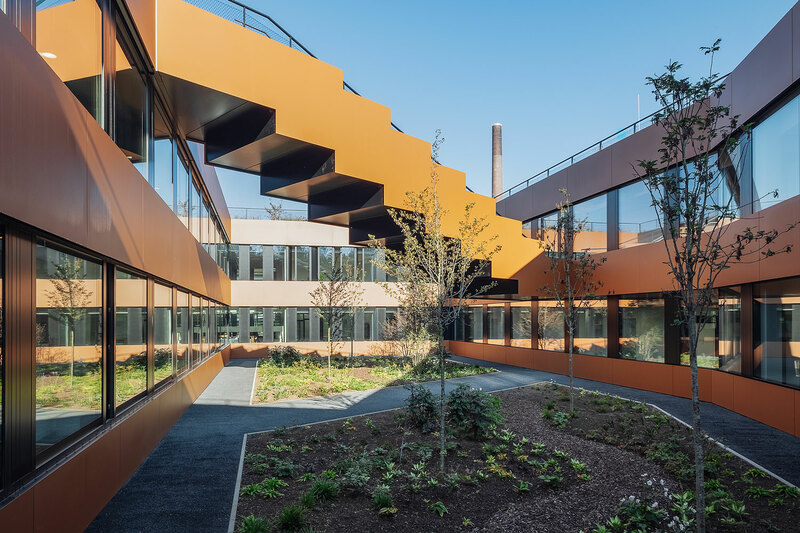 This creates a clear edge towards the street and defines a “gateway to the park” through a window-like opening opposite to the workshop building. 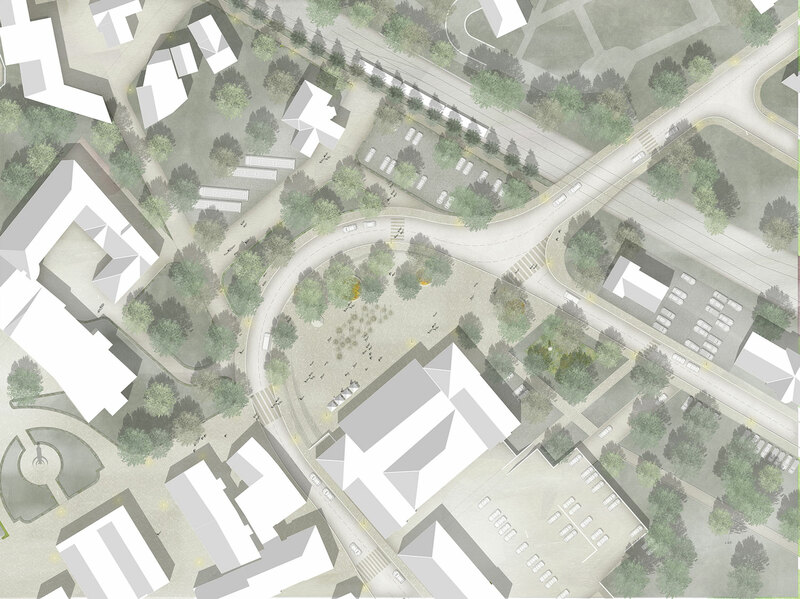 The view angles and visual links from the park to the historic ensemble of workshop buildings/engine as well as the lines of the surrounding buildings determine the edges of the new architecture. 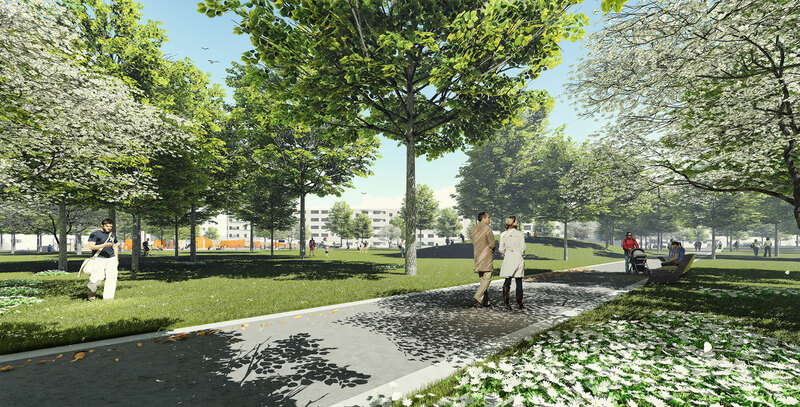 Towards the street, the villas appear as one entity; towards the park, they seem to be random and playful. 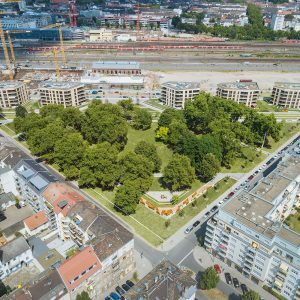 The new office and residential complex at Weichserhof aims to create a destination in southern Cologne. 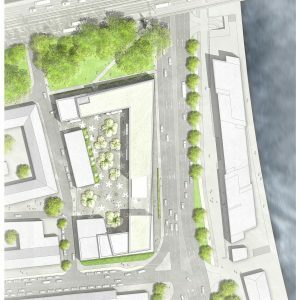 The new development along with the existing Microsoft building marks a new city entrance in the south. 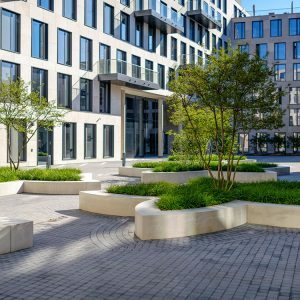 The new pedestrian passage between “Katharinengraben” and “Holzwerft” enables creation of an iconic square in the office complex. 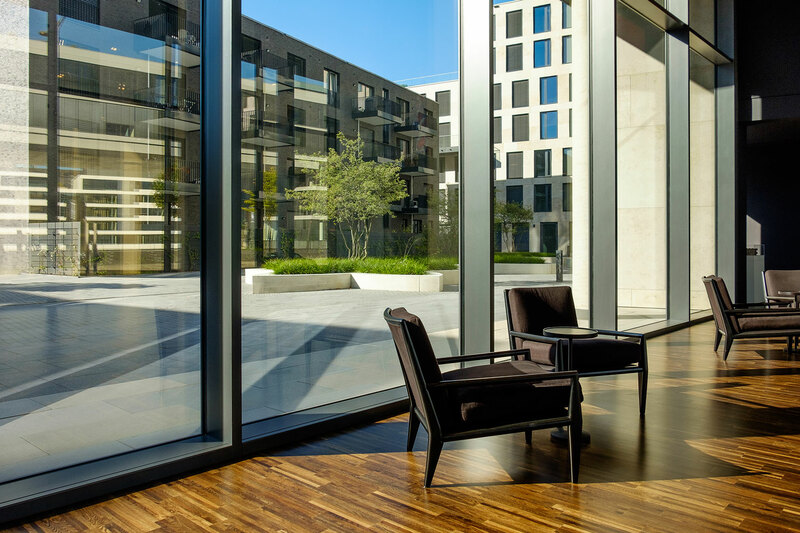 A natural stone ‘carpet’, bordered by brass banding welcomes the visitors. 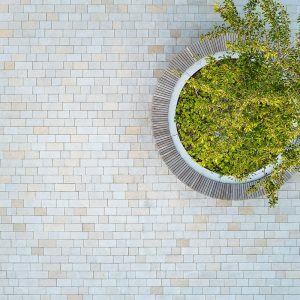 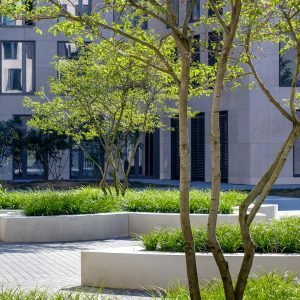 The unique spatial character of this semi-public “garden courtyard” has been achieved through landscaping. 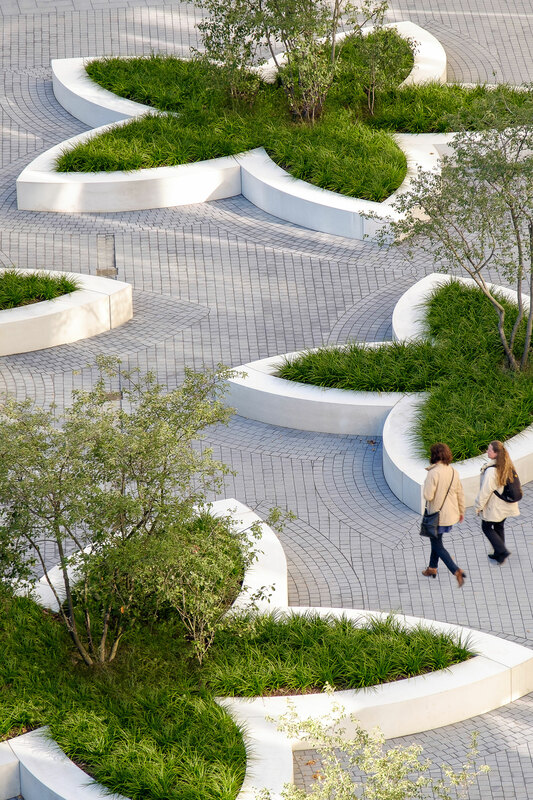 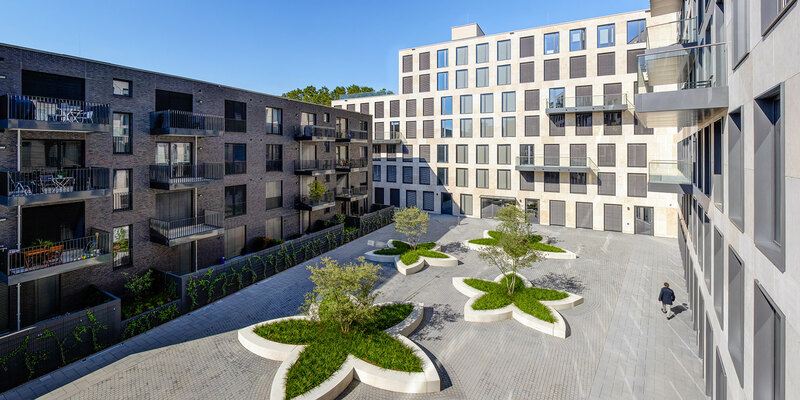 The flower-shaped planting islands in the courtyard, form a playful contrast to the otherwise linear architecture. 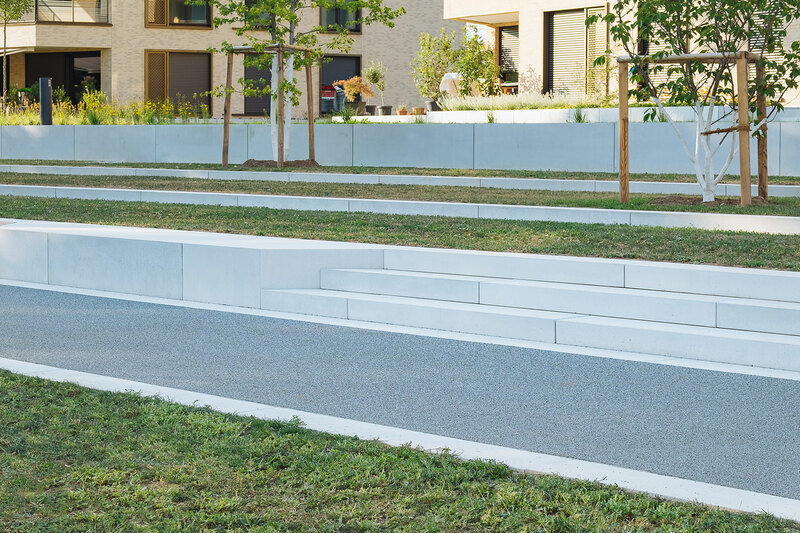 Wide edges of these islands also provide seating opportunity and invites people to linger. 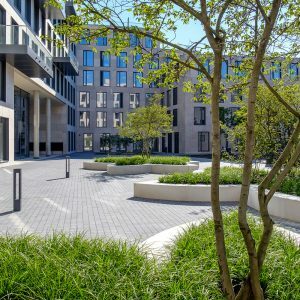 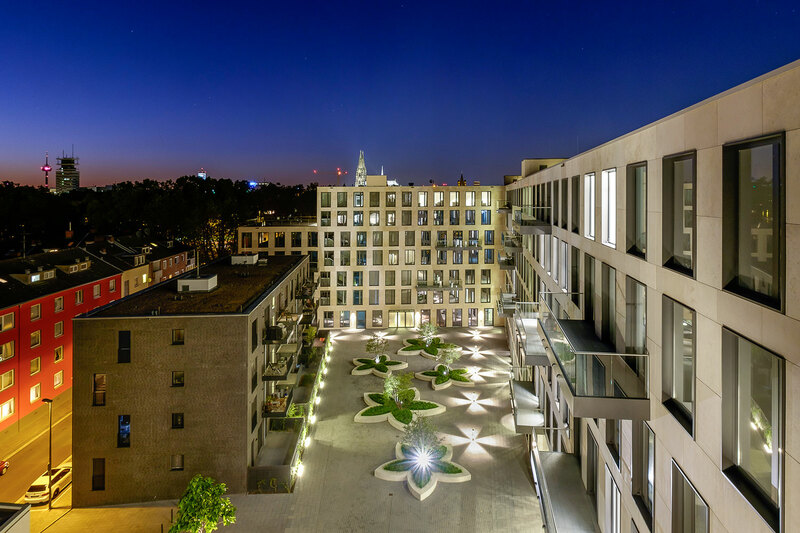 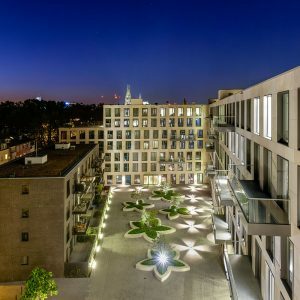 To summarize, an urban ambience, that encourages communication, characterizes inner courtyard of the new buildings at Weichserhof.